As hard as it is to believe, the Brussels experiment continues. 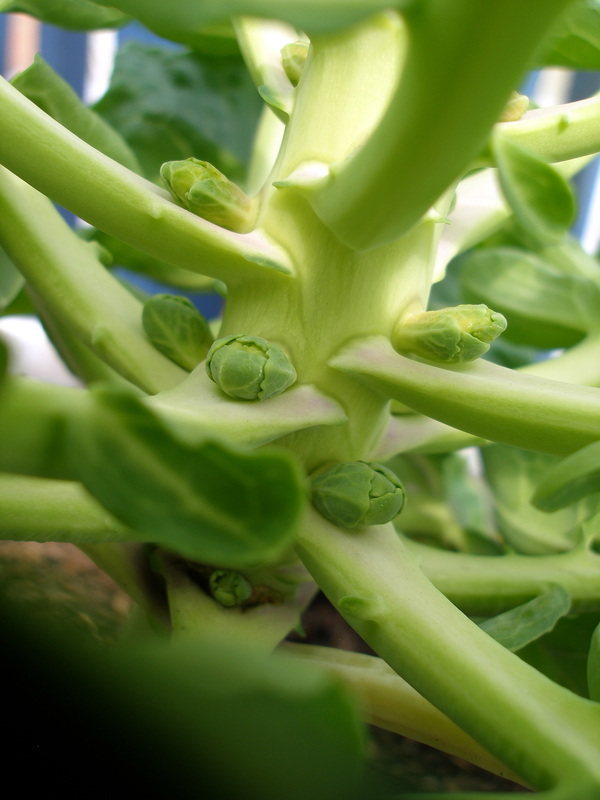 These Franklin Hybrid sprouts started as seeds on August 7, 2009. Insulated with a layer of Michigan pine boughs throughout the winter, they may have survived the snowpacalypse and snowmageddon of 2009 and 2010. Of course, this pot has a date with a tomato seedling on April 20, so we’ll just have to see how quickly these guys decide to mature (we’re already well past our 80 day mark, but then again, one suspects they took the winter off). i also have brussels that survived the winter, will they fruit this year or should i pull them??? Honestly, I’m not entirely sure. I’ve done a bunch of research and it looks like the answer is “maybe.” Here’s my best guess: if there are solid little button-like nubbins growing along the stalk, at the base of the leaves, they may mature into sprouts. If the nubbins look flowery, they’ve blown and will not result in sprouts. 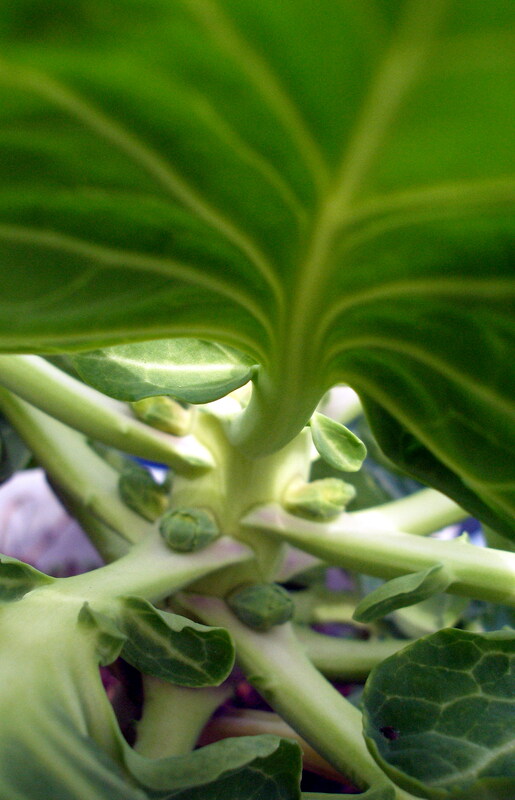 On my plant, the lower sprouts look good, but as you ascend the stalk they appear blown. I’ll be nipping these off so the plant focuses on the healthy sproutlets. Good luck. Please let me know how your sprouts fare! It is pretty ambitious, but go for it! I’ve had decent luck with Spacemasters and lemon cucumbers. I’m trying a couple of new varieties this year, so we shall see. I use white 5-gallon buckets (not pretty, but they reflect the heat) — I wouldn’t recommend planting more than one or two plants per container. Make sure you stick a trellis in the bucket so the vines have something to climb. They like lots of sunshine and to be kept consistently watered. Good luck! That sounds good. Did you drill holes in the bottom of the buckets? I think I’m going to just go for it and jump in with both feet. My Mom is an avid gardener and has been most of her life, so she always has a lot of good advice. I don’t think the gardening gene was transferred to me though, haha. That’s what I thought about the whole gardening gene (my mom is a super-green thumb) — I always hated gardening as a kid. Funny how life works. You’ll definitely want to drill a few holes in the bottom. I also use a couple inches of styrofoam (it’s a good way to reuse that evil stuff) or lava rocks to provide additional drainage.